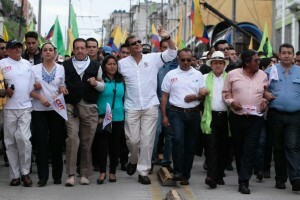 Ecuadorian President Rafael Correa at a May Day March in Quito. Bulletin: In a speech late on June 15, Ecuador’s President Rafael Correa said that the Inheritance Law proposal, which is discussed below, will be temporarily halted while opening a public debate that will further clarify the law’s goals. Once again, rightists inside a country, together with international imperialist support, have leveled their attack against another Latin American country that seeks, like many others in the region, a change in favor of the excluded masses. This time the country is Ecuador. Before Ecuadorian President Rafael Correa left for Europe to attend the second CELAC-EU Summit, he submitted to Ecuador’s Congress a bill on redistribution of wealth, also known as the Law of Inheritance, which will be discussed for 30 days before being voted on. This new law would increase inheritance taxes for those inheriting more than $35,400. The current law taxes heirs for amounts over $68,000, under legislation dating from 1927. The project, which is backed by ­Correa’s party, Alianza PAÍS, is intended to ensure fair taxation and that the rich pay what they should. It is a progressive tax, where the percentage applied would range from 2.5 percent up to 77.5 percent depending on the amount inherited. This project has aroused the right-wing opposition, who not only want to defeat the bill, but who aim to overthrow the government of Correa and Alianza PAÍS’s program, called the Citizen’s Revolution. The rightists also have in their gunsights the 2017 presidential election and aim to weaken the support of the masses for the current government. Since Monday, June 8, it seems that they are taking advantage of the absence of the chief executive. The extreme right, along with national corporate media and the international imperialist media have unleashed a wave of protests against the government, primarily in the capital Quito but also in other Ecuadorian cities. 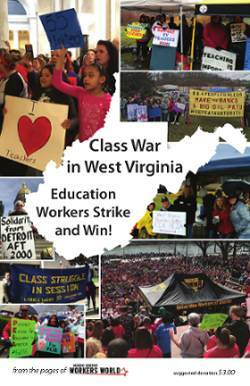 These forces have tried to mount a campaign of misinformation directed at the people in the middle and the working class, arguing that the new law will affect all the people, including the middle class and the working class. The government has tried to combat this misinformation by explaining the law in detail. Sometimes this rightist swamp of rich people, entrepreneurs and right-wing politicians has become violent, attacking pro-government demonstrators who have also taken to the streets to defend the government’s political process. A police force standing between the two sides has prevented more direct confrontations. The Citizen’s Revolution, like every political process, has contradictions, errors and strengths. However, anti-imperialists and progressive forces internationally must have the priorities very clear. It is the people who are sovereign and who have to decide their destiny for themselves. So far, the masses are defending the process laid out by the Citizen’s Revolution. A retreat would be a gain for the rightists and the imperialist plans, led by Washington. It would appear that Jacobson, on behalf of the Empire, was subtly preparing the scenario that would unfold only days later. Calling “offensive” the allegations of the government in Washington, Ecuador’s foreign minister stated that instead of responding, the government in Quito will send to the U.S. State Department documentation highlighting freedom of expression in the Ecuadorian media. He added that the U.S. has no moral high ground to make such an indictment when it continues to imprison people in Guantánamo. He said thousands of copies of this response will be sent to all those targeted by the U.S., including surviving victims of U.S. drone attacks and their relatives and survivors of the U.S. invasion of Iraq. 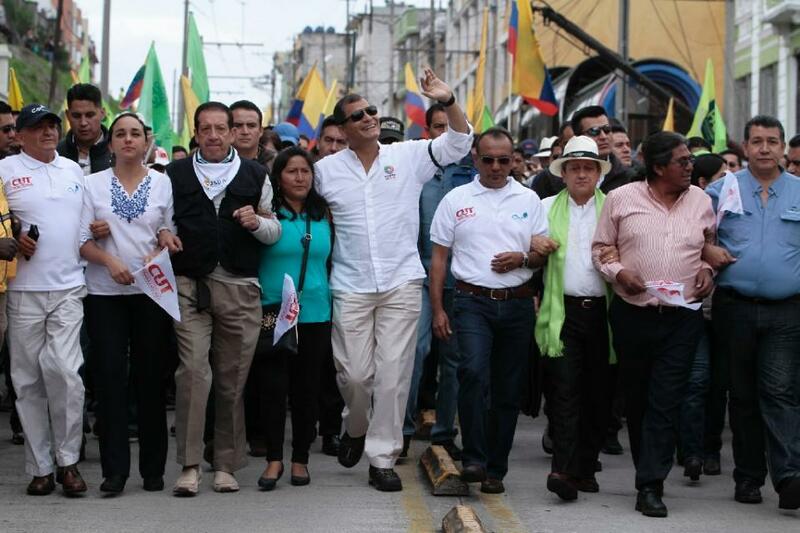 The Ecuadorian people are still taking to the streets and at the time this article is being written (Monday, June 15) are carrying out a massive demonstration in support of the government of Rafael Correa in front of the Palace of Carondelet in Quito. Expressions of support for the Ecuadoran government also flood the different social networks.